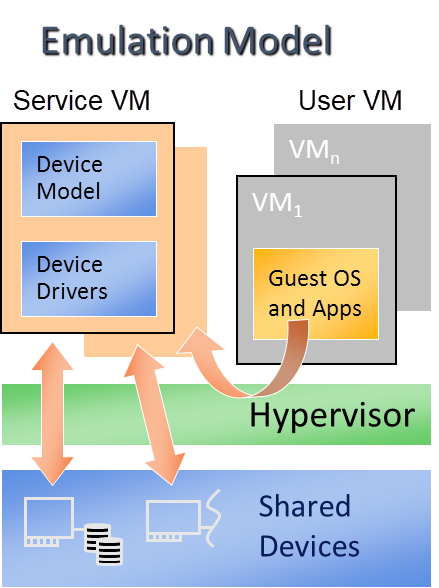 Hypervisor Device Model (DM) is a QEMU-like application in SOS responsible for creating a UOS VM and then performing devices emulation based on command line configurations. Device Emulation: DM provides backend device emulation routines for frontend UOS device drivers. These routines register their I/O handlers to the I/O dispatcher inside the DM. When the VHM assigns any I/O request to the DM, the I/O dispatcher dispatches this request to the corresponding device emulation routine to do the emulation. HV initializes an I/O request and notifies VHM driver in SOS through upcall. This chapter introduces how the acrn-dm application is configured and walks through the DM overall flow. We’ll then elaborate on device, ISA, and PCI emulation. See Device Model Parameters for more detailed descriptions of these configuration options. DM Start: DM application starts to run. Option Parsing: DM parse options from command line inputs. VM Create: DM calls ioctl to SOS VHM, then SOS VHM makes hypercalls to HV to create a VM, it returns a vmid for a dedicated VM. Set I/O Request Buffer: the I/O request buffer is a page buffer allocated by DM for a specific VM in user space. This buffer is shared between DM, VHM and HV. Set I/O Request buffer calls an ioctl executing a hypercall to share this unique page buffer with VHM and HV. Please refer to chapter 3.4 and 4.4 for more details. Memory Setup: UOS memory is allocated from SOS memory. This section of memory will use SOS hugetlbfs to allocate linear continuous host physical address for guest memory. It will try to get the page size as big as possible to guarantee maximum utilization of TLB. It then invokes a hypercall to HV for its EPT mapping, and maps the memory segments into user space. PIO/MMIO Handler Init: PIO/MMIO handlers provide callbacks for trapped PIO/MMIO request which are triggered from I/O request server in HV for DM owned device emulation. This is the endpoint of I/O path in DM. After this initialization, device emulation driver in DM could register its MMIO handler by register_mem() API and PIO handler by register_inout() API or INOUT_PORT() macro. 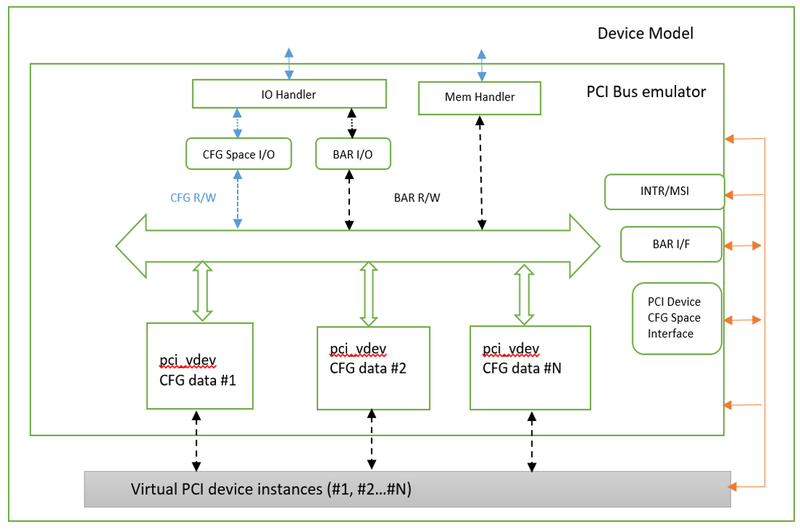 PCI Init: PCI initialization scans PCI bus/slot/function to identify each configured PCI device on the acrn-dm command line and initializes their configuration space by calling their dedicated vdev_init() function. For more detail of DM PCI emulation please refer to section 4.6. ACPI Build: If there is “-A” option in acrn-dm command line, DM will build ACPI table into its VM’s F-Segment (0xf2400). This ACPI table includes full tables for RSDP, RSDT, XSDT, MADT, FADT, HPET, MCFG, FACS, and DSDT. All these items are programed according to acrn-dm command line configuration and derived from their default value. For example, if the UOS memory is set as 800M size, then SW Load will prepare its ramdisk (if there is) at 0x31c00000 (796M), bootargs at 0x31ffe000 (800M - 8K), kernel entry at 0x31ffe800(800M - 6K) and zero page at 0x31fff000 (800M - 4K). The hypervisor will finally run VM based on these configurations. * so the memory layout could be separated into lowmem & highmem. Mevent Dispatch Loop: It’s the final loop of the main acrn-dm thread. mevent dispatch will do polling for potential async event. Device Model manages UOS VM by accessing interfaces exported from VHM module. VHM module is an SOS kernel driver. The /dev/acrn_vhm node is created when VHM module is initialized. 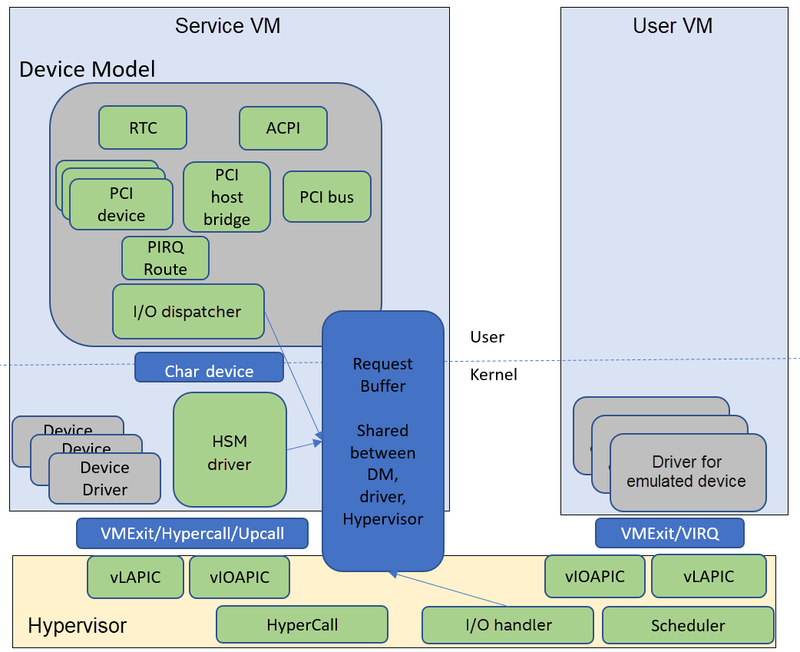 Device Model follows the standard Linux char device API (ioctl) to access the functionality of VHM. I/O request client management is implemented in VHM. 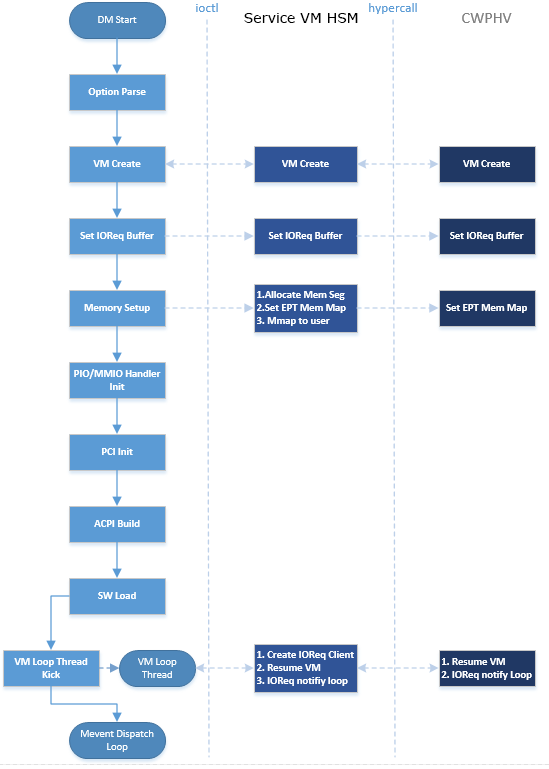 For memory range management of UOS VM, VHM needs to save all memory range info of UOS VM. The subsequent memory mapping update of UOS VM needs this information. I/O requests from the hypervisor are dispatched by VHM in the SOS kernel to a registered client, responsible for further processing the I/O access and notifying the hypervisor on its completion. For each VM, there is a shared 4-KByte memory region used for I/O request communication between the hypervisor and SOS. Upon initialization of a VM, the DM (acrn-dm) in SOS userland first allocates a 4-KByte page and passes the GPA of the buffer to HV via hypercall. The buffer is used as an array of 16 I/O request slots with each I/O request being 256 bytes. This array is indexed by vCPU ID. 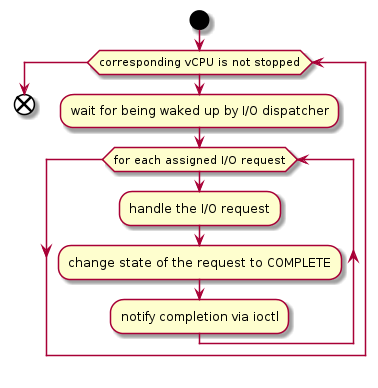 Thus, each vCPU of the VM corresponds to one I/O request slot in the request buffer since a vCPU cannot issue multiple I/O requests at the same time. By this design, a VM supports a maximum of 16 vCPUs. An I/O client is either a SOS userland application or a SOS kernel space module responsible for handling I/O access whose address falls in a certain range. Each VM has an array of registered I/O clients which are initialized with a fixed I/O address range, plus a PCI BDF on VM creation. There is a special client in each VM, called the fallback client, that handles all I/O requests that do not fit into the range of any other client. In the current design the device model acts as the fallback client for any VM. Each I/O client can be configured to handle the I/O requests in the client thread context or in a separate kernel thread context. 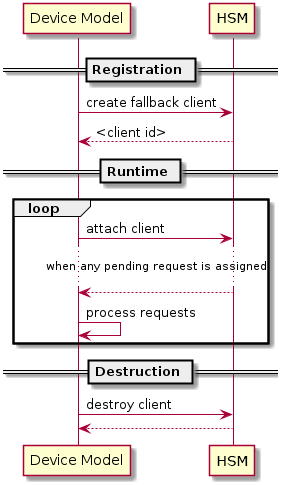 Figure 119 shows how an I/O client talks to VHM to register a handler and process the incoming I/O requests in a kernel thread specifically created for this purpose. On registration, the client requests a fresh ID, registers a handler, adds the I/O range (or PCI BDF) to be emulated by this client, and finally attaches it to VHM which creates the kicks off for a new kernel thread. The kernel thread waits for any I/O request to be handled. 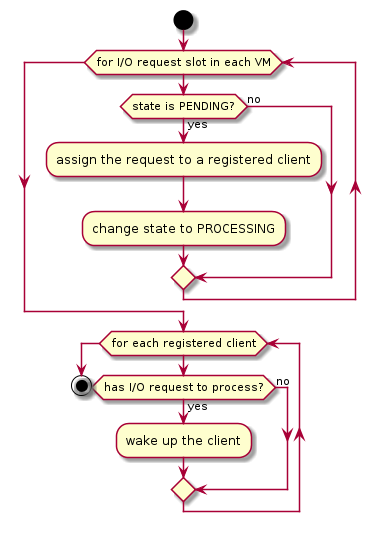 When a pending I/O request is assigned to the client by VHM, the kernel thread wakes up and calls the registered callback function to process the request. 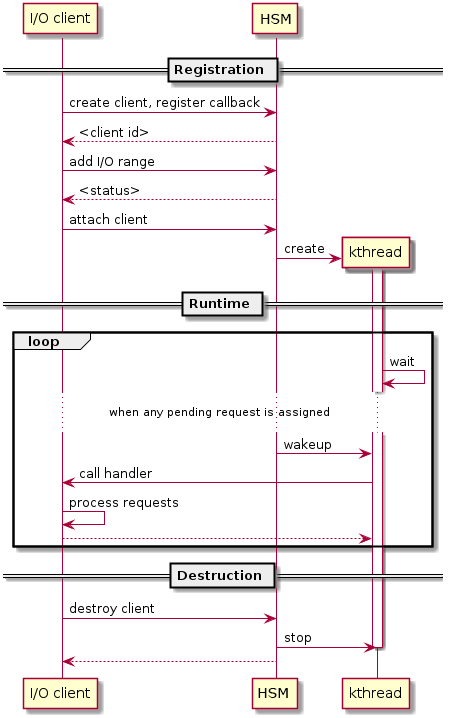 Before the client is destroyed, VHM ensures that the kernel thread exits. An I/O client can also handle I/O requests in its own thread context. Figure 120 shows the interactions in such a case, using the device model as an example. No callback is registered on registration and the I/O client (device model in the example) attaches itself to VHM every time it is ready to process additional I/O requests. Note also that the DM runs in userland and talks to VHM via the ioctl interface in VHM ioctl interfaces. Refer to I/O client interfaces for a list of interfaces for developing I/O clients. 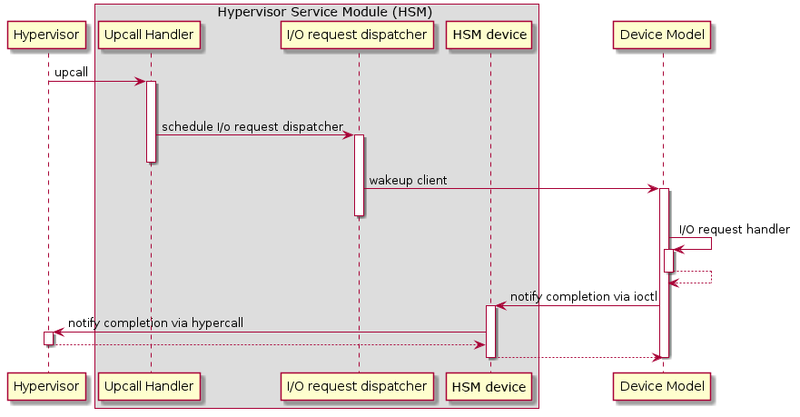 The hypervisor makes an upcall to SOS as an interrupt handled by the upcall handler in VHM. The upcall handler schedules the execution of the I/O request dispatcher. If the dispatcher is already running, another round of execution is scheduled. The I/O request dispatcher looks for I/O requests with the PENDING state, assigns them to registered clients based on the address of the I/O access, updates their state to PROCESSING, and wakes up all clients that have I/O requests to be processed. The flow is illustrated in more detail in Figure 122. The waked client (the DM in Figure 121 above) handles the assigned I/O requests, updates their state to COMPLETE, and notifies the VHM of the completion via ioctl. Figure 123 show this flow. The VHM device notifies the hypervisor of the completion via hypercall. PCI configuration spaces are accessed by writing to an address to I/O port 0xcf8 and then reading the I/O port 0xcfc. As the PCI configuration space of different devices is emulated by different clients, VHM handles the emulation of accesses to I/O port 0xcf8, caches the BDF of the device and the offset of the register, and delivers the request to the client with the same BDF when I/O port 0xcfc is accessed. The following table summarizes the emulation of accesses to I/O port 0xcf8 and 0xcfc. Store to 0xcf8 If MSB of value is 1, cache BFD and offset, otherwise, invalidate cache. The DM emulates different kinds of devices, such as RTC, LPC, UART, PCI devices, virtio block device, etc. It is important for device emulation can handle I/O requests from different devices including PIO, MMIO, and PCI CFG SPACE access. For example, a CMOS RTC device may access 0x70/0x71 PIO to get CMOS time, a GPU PCI device may access its MMIO or PIO bar space to complete its framebuffer rendering, or the bootloader may access a PCI devices’ CFG SPACE for BAR reprogramming. The DM needs to inject interrupts/MSIs to its frontend devices whenever necessary. For example, a RTC device needs get its ALARM interrupt, or a PCI device with MSI capability needs to get its MSI. DM also provides a PIRQ routing mechanism for platform devices. This chapter will do a quick introduction of different I/O requests. * inout emulation handlers return 0 on success and -1 on failure. As VHM intercepts the cf8/cfc PIO access for PCI CFG SPACE, the DM only needs to provide CFG SPACE read/write handlers directly. Such handlers are defined as shown below. Normally, a device emulation developer has no need to update this function. /* Request and release the INTx interrupt resource. Figure 124 shows a PCI device PIRQ routing example. On a platform, there could be more PCI devices than available IRQ pin resources on its PIC or IOAPIC interrupt controller. 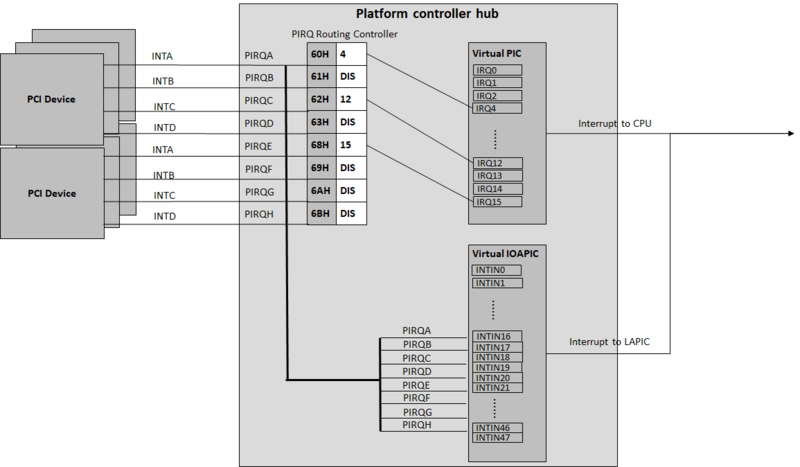 ICH HW provides a PIRQ Routing mechanism to share IRQ pin resources between different PCI devices. * is not yet assigned. The PIRQ routing for IOAPIC and PIC is dealt with differently. For IOAPIC, the irq pin is allocated in a round-robin fashion within the pins permitted for PCI devices. The irq information will be built into ACPI DSDT table then passed to guest VM. For PIC, the pin2irq information is maintained in a pirqs array (the array size is 8 representing 8 shared PIRQs). When a PCI device tries to allocate a pirq pin, it will do a balancing calculation to figure out a best pin vs. irq pair. The irq# will be programed into PCI INTLINE config space and the pin# will be built into ACPI DSDT table then passed to guest VM. “irq” here is also called as “gsi” in ACPI terminology . Regarding to INT A/B/C/D for PCI devices, DM just allocates them evenly prior to PIRQ routing and then programs into PCI INTPIN config space. There is no explicit ISA emulation structure in DM; it calls the corresponding device initialization functions directly, and takes the usage of PIO/MMIO handler and interrupt APIs (described in I/O Client Interfaces) in its routine. During PCI initialization, ACRN DM will scan each PCI bus, slot and function and identify the PCI devices configured by acrn-dm command line. The corresponding PCI device’s initialization function will be called to initialize its config space, allocate its BAR resource, its irq, and do its irq routing. The pci_vdev_ops of the pci_vdev structure could be installed by customized handlers for cfgwrite/cfgread and barwrite/barread. The cfgwrite/cfgread handlers will be called from the configuration space handler. The barwrite/barread will be called from the PIO/MMIO handler. The PCI emulation device will make use of interrupt APIs as well for its interrupt injection. For Clear Linux OS, the lspci command can be installed from the “sysadmin-basic” bundle. Advanced Configuration and Power Interface (ACPI) provides an open standard that operating systems can use to discover and configure computer hardware components to perform power management for example, by monitoring status and putting unused components to sleep. root@:Dom0 ~ $ cp /sys/firmware/acpi/tables/DMAR . From the displayed ASL, we can see some generic table fields, such as version info, and one VTd remapping engine description with FED64000 as base address. A new AML file DMAR.aml is created. Most modern OSes requires ACPI, so we need ACPI virtualization to emulate one ACPI-capable virtual platform for guest OS. To achieve this, there are two options, depending on the way to abstract physical device and ACPI resources: Partitioning and Emulation. For each VM, its ACPI tables are a standalone copy, not related to the tables for other VMs. Opregion also must be copied for different VMs. For each table, we make modifications, based on the physical table, to reflect the assigned devices to this VM. As shown in the figure below, we keep SP2(0:19.1) for VM0, and SP1(0:19.0)/SP3(0:19.2) for VM1. Anytime partition policy changes we must modify both tables again, including dissembling, modifying, and assembling, which is tricky and potentially error-prone. An alternative ACPI resource abstraction option is for the SOS (SOS_VM) to own all devices and emulate a set of virtual devices for the UOS (NORMAL_VM). 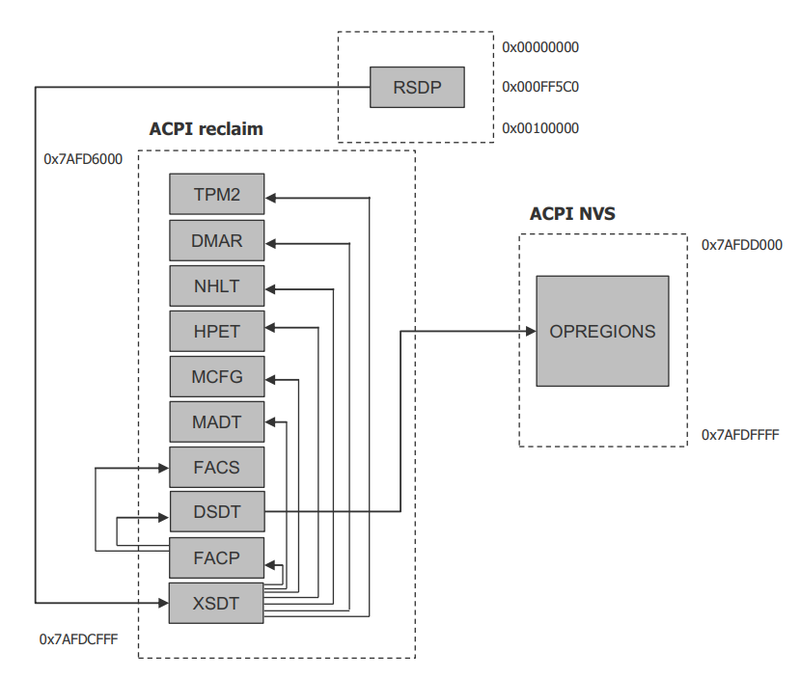 This is the most popular ACPI resource model for virtualization, as shown in the picture below. ACRN currently uses device emulation plus some device passthrough for UOS. Hypervisor - ACPI is transparent to the Hypervisor, and has no knowledge of ACPI at all. SOS - All ACPI resources are physically owned by SOS, and enumerates all ACPI tables and devices. UOS - Virtual ACPI resources, exposed by device model, are owned by UOS. After handling each entry, virtual ACPI tables are present in UOS memory. For instance, write_dsdt_urt1 provides ACPI contents for Bluetooth UART device when passthroughed to UOS. It provides virtual PCI device/function as _ADR. With other description, it could be used for Bluetooth UART enumeration. PM module in Device Model emulate the UOS low power state transition. Each time UOS writes an ACPI control register to initialize low power state transition, the writing operation is trapped to DM as an I/O emulation request by the I/O emulation framework. To emulate UOS S5 entry, DM will destroy I/O request client, release allocated UOS memory, stop all created threads, destroy UOS VM, and exit DM. To emulate S5 exit, a fresh DM start by VM manager is used. To emulate UOS S3 entry, DM pauses the UOS VM, stops the UOS watchdog, and waits for a resume signal. When the UOS should exit from S3, DM will get a wakeup signal and reset the UOS VM to emulate the UOS exit from S3.